M/S PEACOCK ENGINEERING (INDIA) EQPTS. PEIE Design, Engineering, Manufacture, shop-test , Supply, Erection & commissioning 2nd generation Slag Crushing & Beneficiations Plant in TPM methodology with following customer delighting features. Conveyors used here to convey in process material from one equipment bottom to next equipment top. 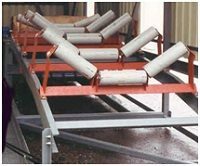 Belt Conveyors chosen here for granular bulk quantity, dust resistivity and low cost. Light structure, stable performance, Convenient maintenance and economical running expense. 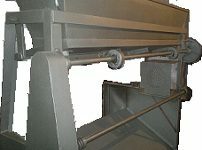 Vibrating screens are used here for oversize screening and dust separation. Wear resistant side plates, Light structure, stable performance, Convenient maintenance and economical running expense. 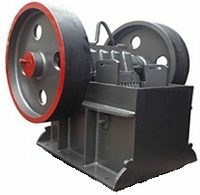 Jaw Crusher is mainly used here to crush Slag, Coal, CaCO3, Talc, Rock, Refractory, Glass , Stone , Barite. The largest compression resistance of the material to be crushed is 3263 Kg/cm2. Firm structure, stable performance, even producing granularity. 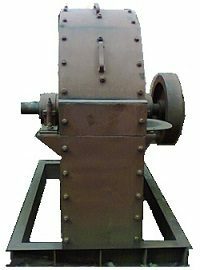 Convenient maintenance and economical running expense..
Large feed opening and force-feeding action from the inward and downward eccentric movement of the swing jaw leads our jaw crusher can increase the capacity. 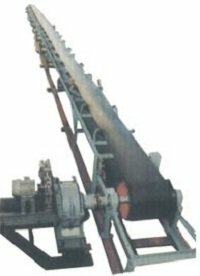 Roller Crusher is used for re-crush Slag, Coal, CaCO3, Talc, Rock, Refractory, Glass , Stone , Barite. 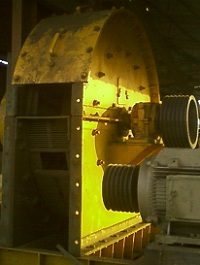 Large feed opening and force-feeding swing action leads our roller crusher can increase the capacity. 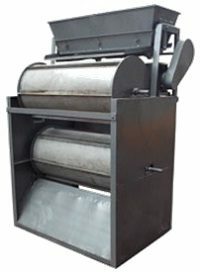 Magnetic Separator is used here to separate iron from bulk quantity non-magnetic processed end product. 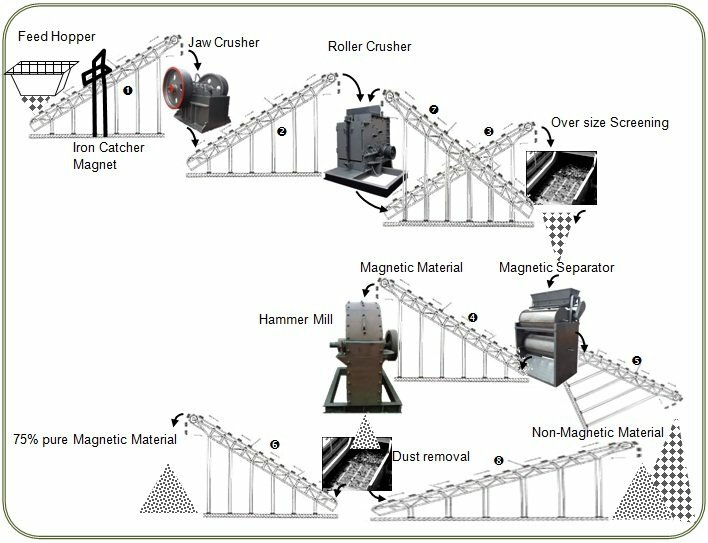 The crushed material from roller crusher, the mixture of metal contaminates & sand contaminates fed through magnetic drum separator. 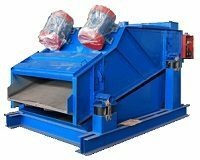 As the material evenly through a vibrating feeder falls over the drum, powerful magnetic field attracts & hold iron particles to the revolving shell & automatically discharged at the other end and the sand contaminates falls freely from the shell. Permanent magnets are used for everlasting strength during normal use. Large feed opening 5000 gauss magnetic action leads our separator can increase the capacity. 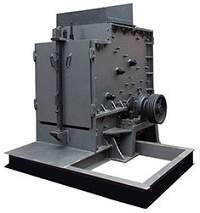 Our Hammer Mills are used after secondary crushing of industrial materials. The precisely balanced design of opposite beater arms and heads are made of high quality steel and easy to replace. 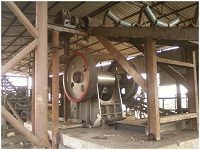 Firm structure, stable performance, Convenient maintenance and economical running expense.. 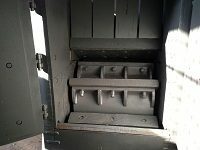 Replaceable grates in lower section of body to reduce oversize grains. Home | Site map | Terms & condition | Disclaimer | © Peacock Engineering (India) Eqpts.